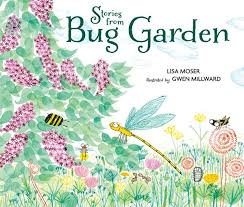 Lisa Moser takes a different turn in her latest picture book STORIES FROM BUG GARDEN (Candlewick Press, 2016). Moser is known for traditional picture book stories like WATERMELON WISHES, KISSES ON THE WIND and RAILROAD HANK. 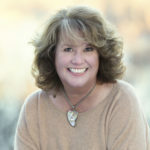 But in her recent release, she creates a collection of delightful poems about a bunch of bugs who move into an abandoned garden and make it their home. The poems are linked, because they all relate to the bugs’ time in the garden, but readers can open the book and read the poems at random and have a thoroughly enjoyable experience. What I especially love about these poems is their simplicity and subtle humor. Whether they’re about a ladybug who doesn’t consider herself ladylike, an ant and a cricket debating the proper way to pick a peach, or a lightening bug who never wins at hide and seek, you will find yourself smiling and nodding and admiring as you read. And, really, what more could you ask for? Gwen Millward’s simple, colorful illustrations are the perfect complement to Moser’s words. “What are you doing?” asked Butterfly. “I am running,” said Horsefly. “See the wind ripple my mane? See my mighty hooves flash? as he ran around the garden. “You know you’re not a horse. He looked at Butterfly and sniffed. Then he ran some more. 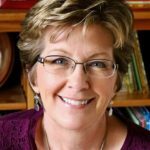 You can learn more about Lisa and her wonderful books here. Lisa Moser, Pat Zietlow Miller, picture book, poetry. Bookmark. I’d already found (and enjoyed!) this book. I think others are going to love it, too. Stories From Bug Garden is absolutely delightful! I read it to my three nieces and we were all giggling. Kudos to Lisa and Gwen for creating such a charming book!! Thanks, I just put this on my list. Love this poem! This one’s definitely going on my list. Thanks for bringing it to my attention, Pat. And congrats, Lisa! wonderful! makes me want to take a closer look at horseflies before swatting them. Ha! Love it. Thanks for the sample, Pat. Looking forward to reading more! Love the teaser -sounds sweet and funny. Looking forward to reading! I just read this one a few weeks ago & really enjoyed it. The illustrations were adorable too! I haven’t read any of Lisa’s other books, so I will get on that! Fun! Sounds like I’m going to want to add it to my collection! HORSEFLY AND BUTTERFLY is such a clever poem! I read it over and over . . . and each time it made me smile. This is a thoughtful and lovely poem – can’t wait to get the book and read some more of her poems. What a delightful poem! I can’t wait to find this book and read the rest of them. Wonderful! I look forward to reading the whole book. Thank you. Ahhhhh, this would be such fun to illustrate! Looks wonderful and will check it out— Thanks so much!